The Volunteer Service Organization (VSO) provides students with weekly, varied volunteer opportunities. Through established connections with a wide array of community partners, VSO brings groups of students to worksites that range from Helen Porter Medical Center to Wild Roots Farm. 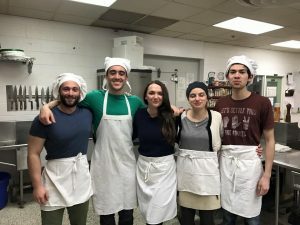 In the spirit of enacting direct, measurable service, student volunteers not only get the opportunity to grow closer to the people of Middlebury and the surrounding areas, but do so while assisting local organizations with their own programming and service endeavors. After beginning my VSO journey at the beginning of last year, I have steadily increased my commitment to the organization and its events. Since the outset of the ’16-’17 academic year, I have been the president of the Org. As president, I had the opportunity to not only plan programming in conjunction with community partners, but also attend each of the events. Having the chance to spend a few hours a week with different groups of student volunteers has opened my eyes to the true power of cooperation. VSO’s events simply would not be possible without the incredible amount of student support we receive. Seeing groups of students – who are, more often than not, strangers – come together while giving back has been continually inspiring. The forging of new friendships, both on campus and off, has been a formative component of my time at school. It is my sincere hope that students decide to get involved with VSO. Whether that means coming to one event a semester or applying to work on our board, any and all interest is welcome.